ViaAir starting on November 30, 2016 will add the Charlotte – Shenandoah Valley route. 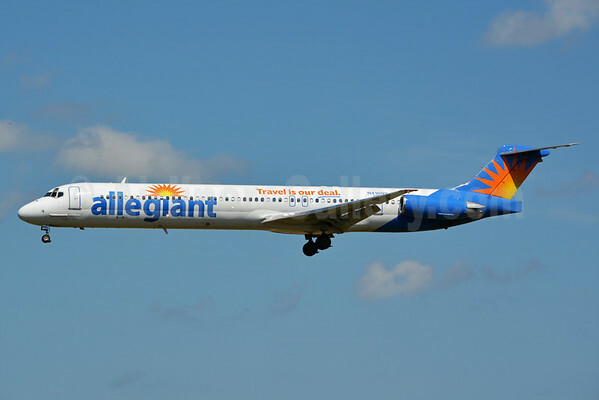 On December 11, 2016 this will be followed by the Charlotte – Sanford (near Orlando) route. 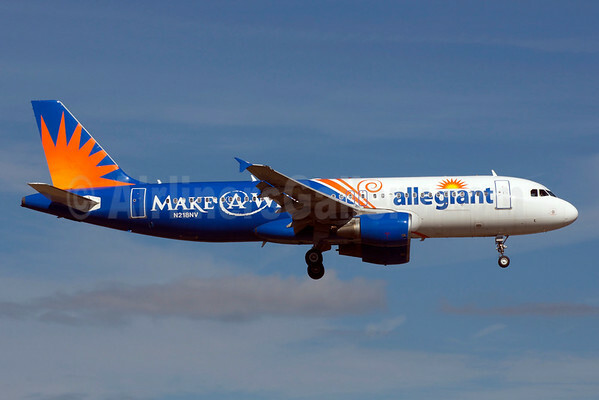 Both routes will be operated with Embraer ERJ 145 regional jets according to Airline Route. 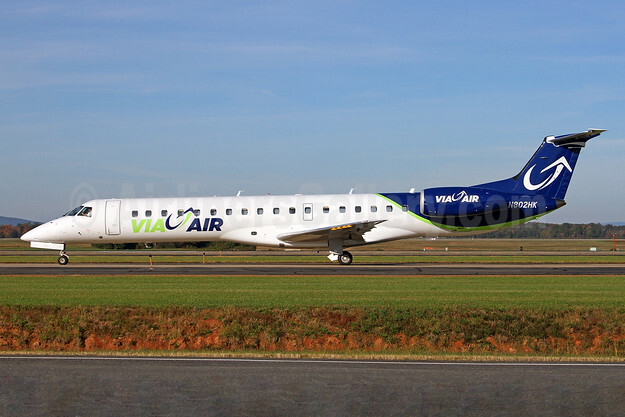 ViaAir LLC is an indirect Air Carrier operating under DOT Regulation 14 CFR 380 together with its subsidiary, Charter Air Transport d.b.a. Via Airlines, as the Direct Air Carrier on 30 Pax EMB-120 and now Embraer ERJ 145 regional jets. Via Airlines was founded in 1997. This entry was posted in Via Air and tagged Charlotte, Sanford, Shenandoah Valley, Via Air on November 18, 2016 by Bruce Drum. 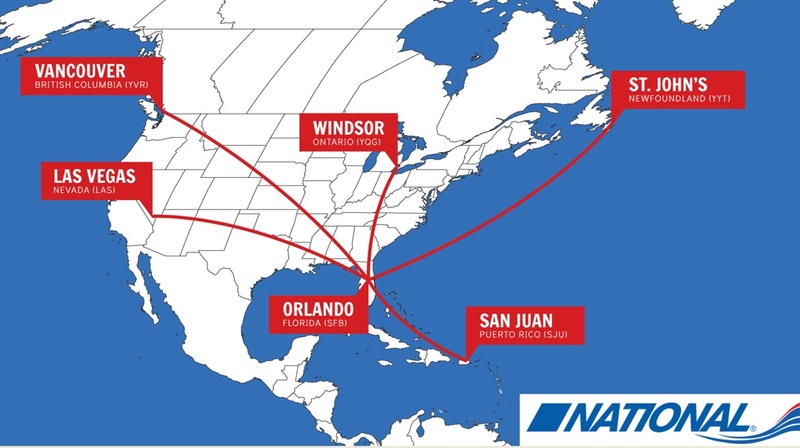 National Airlines (5th) (Orlando) is expanding to Vancouver, British Columbia. Vancouver Airport Authority has announced the upcoming arrival of National Airlines to Vancouver International Airport (YVR). Starting January 20, 2016 , the twice weekly scheduled service will operate between Orlando-Sanford International Airport (SFB) and YVR. 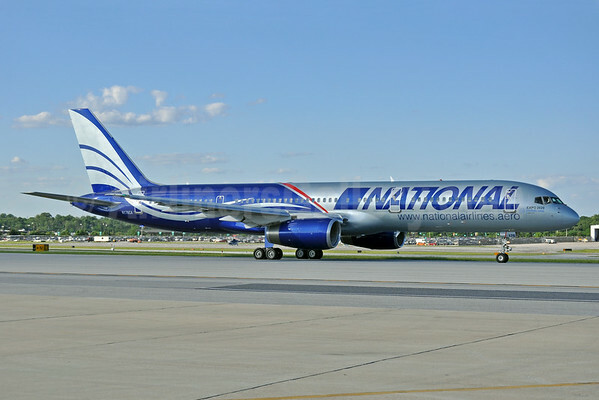 National Airlines will operate a Boeing 757-200 aircraft on the route. Flights will depart SFB on Wednesdays and Saturdays at 18:45 and arrive in YVR at 22:15. The aircraft will turn around and leave YVR at 23:55 and arrive in SFB at 08:30 the following morning. Previously National Airlines announced nonstop service between Windsor, Ontario, (YQG), and Sanford, Florida, (SFB). The inaugural flight, on Thursday, December 17, 2015, will depart Windsor International Airport at 2:30 PM EST and arrive Orlando-Sanford International Airport at 5:00 PM EST. National Airlines will fly this route year ‘round. 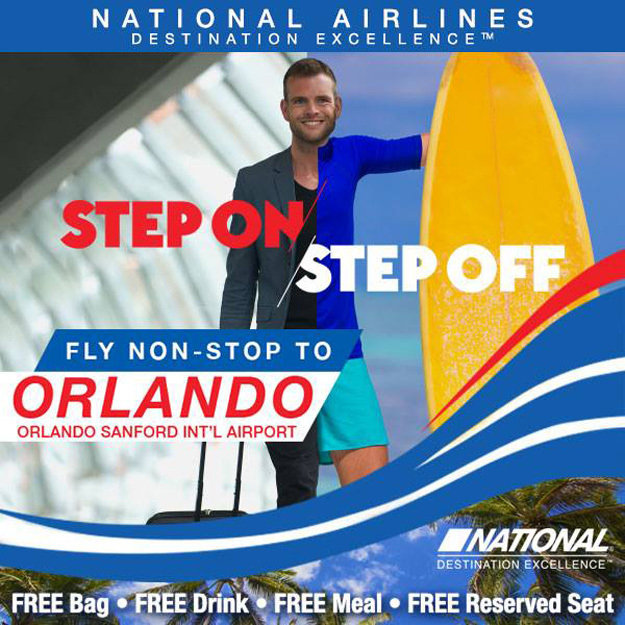 National will offer return flights from Orlando-Sanford International Airport also on Thursdays and Sundays, departing at 10:30 AM EST and arriving in Windsor at 1:00 PM EST. 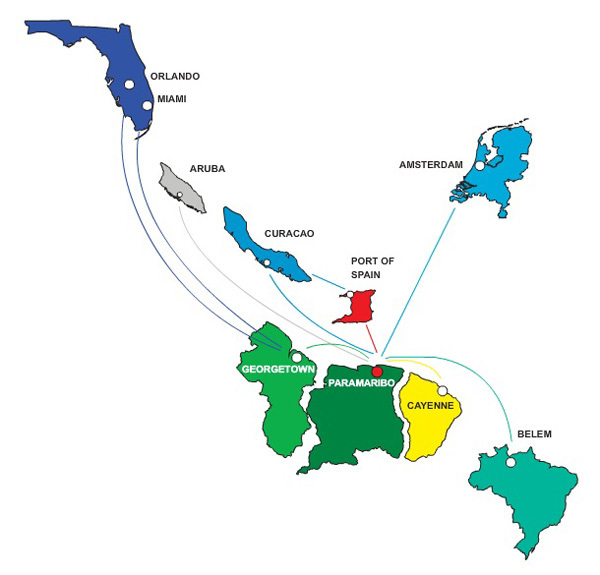 * Flights to/or from Las Vegas and San Juan are Public Charters under DOT PC # 15-189, and operated by National Air Cargo, Inc. d/b/a National Airlines. Copyright Photo: Tony Storck/AirlinersGallery.com. National Airlines (National Air Cargo Group) (5th) Boeing 757-28A N176CA (msn 24543) with special Expo 2020 Dubai UAE markings taxies at Baltimore/Washington (BWI). This entry was posted in National Airlines (5th) and tagged 24543, 757, 757-200, 757-28A, Baltimore/Washington, Boeing, Boeing 757, Boeing 757-200, BWI, N176CA, National Airlines, Sanford, Vancouver, Windsor on October 3, 2015 by Bruce Drum. 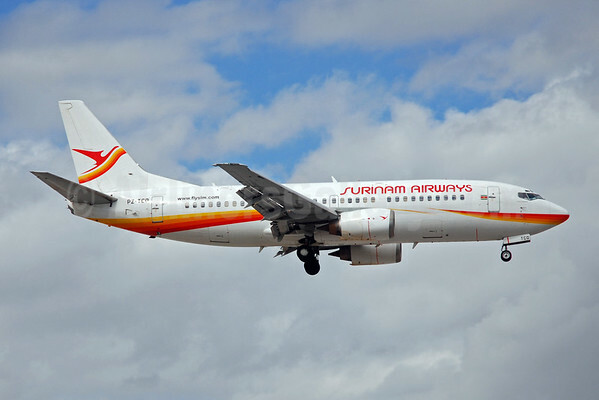 Surinam Airways (Paramaribo) is planning to offer summer seasonal service to Sanford, Florida (near Orlando) from July 2 through September 25. The one-stop service (stopping in Georgetown) will be operated weekly with Boeing 737-300 aircraft. Copyright Photo: Bruce Drum/AirlinersGallery.com. Boeing 737-36N PZ-TCO (msn 28669) prepares to land at Miami International Airport. This entry was posted in Surinam Airways and tagged 28669, 737, 737-300, 737-36N, Boeing, Boeing 737, Boeing 737-300, Florida, MIA, Miami, Orlando, PZ-TCO, Sanford, Surinam Airways on June 23, 2015 by Bruce Drum. 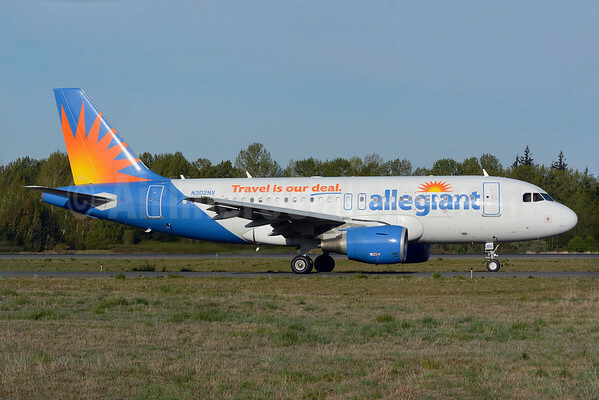 Allegiant Air (Las Vegas) today (May 22) stated nonstop flights from Memphis to Ft. Lauderdale/Hollywood, Las Vegas and Sanford (near Orlando). Copyright Photo below: Bruce Drum/AirlinersGallery.com. McDonnell Douglas DC-9-83 M868GA (msn 49554) arrives at the Las Vegas base. 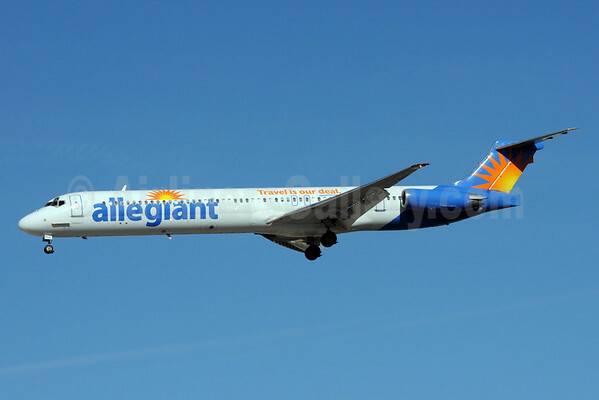 This entry was posted in Allegiant Air and tagged 49554, Allegiant Air, DC-9, DC-9-83, Fort Lauderdale/Hollywood, Las Vegas, McDonnell Douglas, McDonnell Douglas DC-9, McDonnell Douglas DC-9-83, McDonnell Douglas MD-83, MD-83, Memphis, N868GA, Sanford on May 22, 2015 by Bruce Drum.